The Fitbit Alta HR is the company's latest fitness tracker, built to be worn all day and night. As you might have guessed from the name, it's taking the first Fitbit Alta and sticking an optical heart rate sensor on it. It also comes with Fitbit's improved sleep tracking - oh, and a new, more secure strap. If you've got yourself a shiny new Alta HR then you'll want to be sure you know all its secrets. That's why we've pulled together some of the tips and hidden tricks for getting the most out of your tracker. Below you'll find some suggestions for making more of your Fitbit. And be sure to check out our guide for which Fitbit tracker to buy, along with our interview with Fitbit on why it's now turning its attention to sleep. Sleep tracking is one of the big updated features of the Alta HR. Not only can you now see your stages of sleep - light, REM, deep - but the app will serve up insights into how you can improve your sleep, which should get better over time as Fitbit gets to know your habits. To actually see your stages, you'll need to tap on the specific day from the sleep overview. Pro tip: tap again on the top graph to get to an annotated version that explains how each stage of sleep is important for the body. If you're not seeing any insights, head into the menu and scroll right down to the bottom where you'll see the Receive Sleep Insights toggle - make sure it's on. Another tip here is to keep the Alta HR on during day hours as much as possible too, as Fitbit analyses your sleep patterns in context of your activity, and will start delivering more helpful feedback as a result. Move reminders can be useful or annoying depending on how you use them. The good news is that you can tweak them if they're proving overly intrusive or unhelpful. Head into your device options and under the General section and you'll see a Reminders to Move button. Tap that and you'll be able to change the times of day Fitbit will nudge you to get up. You can also choose which days you want reminders to happen on - and switch them off entirely if you'd prefer. When exercising, the Alta HR will display your heart rate zones, moving through fat burn, cardio and up to peak. You can tweak this a little, but you won't find the option in the Fitbit's settings. Instead go to your Account, then scroll down to Heart Rate Zones. Once you're in there you'll be able to add your own custom heart rate zone, setting the upper and lower limit. You can also input your own maximum heart rate, which is useful if you're taking the Alta HR out for more vigorous exercise. This is an important one. The main Alta HR unit comes in one size, but the band is available in small, large and extra large. It's important you keep the Fitbit Alta HR snug against your wrists, as this helps the heart rate monitor to work at its most accurate. Fitbit has a handy wrist size guide to measure yourself against that can be found and printed off here. The Fitbit Alta HR can display quite a bit on its own display including your step count, heart rate, calories burned, remaining battery life and the time. In the app, tap on your Alta HR from the list of devices, then scroll down to Customise Stats and from there you can select which stats will appear, and the order in which they do. By default the battery life isn't shown, so this might be something you'll find particularly useful to add. You can also tweak the layout and change the orientation by tapping on Clock Display, which is just below the Customise Stats button. Fitbit emphasizes the importance of a consistent bedtime, and it has a feature to help you achieve it. Head into Account, then to Sleep, and then roll down to Bedtime. You'll be able to pick a time, and once you have, you'll get a reminder on your Alta HR about half an hour before telling you to wind down for the night. It's one of the smaller, but still potentially useful, features of the Alta HR. Another important one, especially if you're going to be using the Alta HR to track a lot of activity. We all have slightly different stride lengths when walking and running, and Fitbit allows you to manually edit this in the Advanced Settings, which again you'll find under Account. As the Alta HR doesn't have connected GPS, it has a harder job of getting your stride exactly right when this option is set to automatic. It's not going to make all the difference in the world, but we find Fitbit's trackers have a tendency to overcount on steps, so this may go some way to alleviating that problem. Also important is to check you've set your Fitbit to the right wrist - you can do this in your device settings. 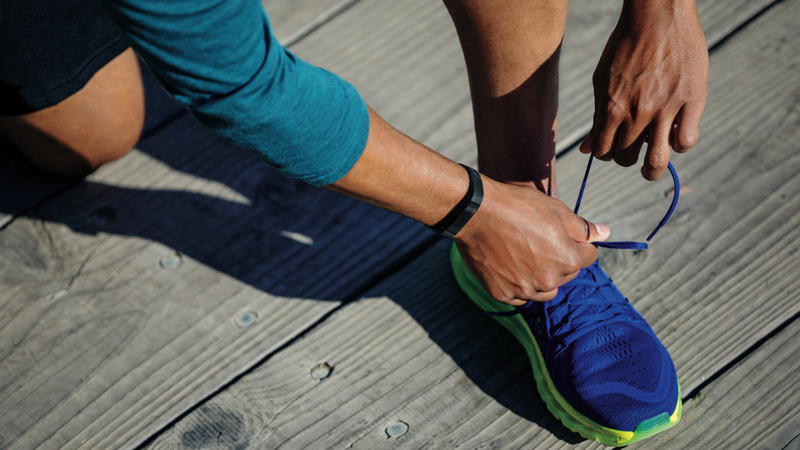 The Fitbit Alta HR should run you a week on a single charge, but there are a couple of things you can do to wring out a little more juice when you're running low. First, you can toggle off all-day syncing by entering your Alta HR device settings. This means your tracker will only sync when you open the app on your smartphone. You can also switch off the Always Connected option, which you'll find under the Help section down the bottom of the same page. Having it on improves the Bluetooth connection and therefore reliability of notifications, but turning it off will get you a bit more battery power. This is less of a hidden tip and more of a gentle reminder that the Alta HR isn't to be taken in the shower, let alone a pool. We say this because it can be easy to forget, especially with many other fitness trackers - the Fitbit Flex 2 included - offering the feature. It's fine for sweat and a bit of rain, but try to remember to take it off before showering. You've been warned.